"Our hands-on approach and portfolio of UC, Cloud PBX, Connectivity, Mobility and more continue to differentiate us"
IPFone announced today that TMC, a global, integrated media company helping clients build communities in print, in person and online, has named IPFone UC as a 2016 Unified Communications Product of the Year Award winner for second year in a row. IPFone Unified Communications (UC) integrates services such as voice and video telephony, chat, presence information, desktop sharing, call control, voicemail, email, SMS and fax. IPFone UC allows businesses and employees to communicate whenever, wherever and however they choose. IPFone UC can be accessible from any device including Windows and MAC, and iPhone, iPads, Android phones and tables. 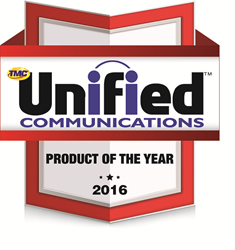 "We are incredibly honored to receive the 2016 Unified Communications Product of the Year Award from TMC for second year in a row" says Damian Chmielewski, IPFone's President & CEO. "IPFone is committed to empowering small, medium and large enterprises with unique solutions that drive productivity and efficiency to businesses. Our hands-on approach and portfolio of UC, Cloud PBX, Connectivity, Mobility and more continue to differentiate us. Thank you to TMC for recognizing our efforts and commitment to our customers." Winners of the 2016 Unified Communications Product of the Year Award will be published in the April 2016 edition of INTERNET TELEPHONY magazine. Global buyers rely on TMC’s content-driven marketplaces to make purchase decisions and navigate markets. This presents branding, thought leadership and lead generation opportunities for vendors/sellers. Unique, turnkey Online Communities boost search results, establish market validation, elevate brands and thought leadership, while minimizing ad-blocking. Custom Lead Programs uncover sales opportunities and build databases. In-Person and Online Events boost brands, enhance thought leadership and generate leads. Publications, Display Advertising and Newsletters bolster brand reputations. Custom Content provides expertly ghost-crafted blogs, press releases, articles and marketing collateral to help with SEO, branding, and overall marketing efforts. Comprehensive Event and Road Show Management Services help companies meet potential clients and generate leads face-to-face. For more information about TMC and to learn how we can help you reach your marketing goals, please visit http://www.tmcnet.com.